Upon your arrival at the "Mother City" of Cape Town you will be collected from the airport by Far and Wild Safaris and taken on a short orientation tour of this magnificent city, before being taken to your hotel close to the Victoria and Alfred Waterfront where you spend two nights. This is a city with a diverse range of attractions, sights and activities on offer - Cape Town has something for everyone. From the landmark beaches of Clifton and Camps Bay to the vibrant Victoria & Alfred Waterfront and Cape Town city centre, the scenery of the Cape Peninsula and more - time spent in Cape Town will not be forgotten. For your own account, should you wish, and with weather permitting, we can visit Table Mountain before proceeding to the hotel. We will overnight at one of the many accommodation options in this city. The Fairest Cape.and it surely is! You'll soon see for yourself where and why it earned its name. Sit back and relax, we're going to cruise along the exquisite stretch of coastline known as Millionaire's Paradise - from Camps Bay and Clifton to the exclusive beach hamlet of Llandudno - towards the charming working harbour of Hout Bay, where, if you so choose, you can embark on an up-close-and-personal Seal Island cruise (for your own account). Once back on terra firma, we wind along the legendary Chapman's Peak Drive, hugging the cliffs and relishing the breathtaking ocean views, before arriving at the wild and beautiful Cape of Good Hope Nature Reserve, an integral part of the world-renowned Cape Floral Kingdom. We meander back along the coast towards the City, visiting the historic naval port of Simon's Town and the endearing penguin colony at Boulder's Beach. We will arrive back in the city in the late afternoon. After breakfast we make our way to Oudtshoorn along "Route 62", the tourist route that meanders between Cape Town and Oudtshoorn, offering the shorter, scenic alternative to the N2 highway. This is an area of magnificent landscapes and towering cliffs, crystal clear streams and the abundance of trees and indigenous flora. The ever changing colours of the majestic mountains, scenic passes, rivers, vineyards and orchards, as well as the attractions, will offer you an unforgettable adventure - whether this is in the physical sense or simply a kaleidoscope of scenic tranquillity. Innovation and pride, combined with a terrain and mild climate that are harmoniously balanced, results in the prominence of this region's wines. We reach Oudtshoorn in the late afternoon, a town that is known as the "feather capital of the world". We will overnight at the Turnberry Boutique Hotel. The Turnberry Boutique Hotel is situated in the centre of the picturesque Klein Karoo town of Oudtshoorn. A warm welcome, awaits visitors to this tiny piece of Scotland set in the heart of the Klein Karoo. Relax in the comfort of one of the well appointed air-conditioned bedrooms (each with satellite television, a coffee station and a mini bar), all with en-suite bathrooms, and cosy double beds fitted with crisp white linen. Each room also has wireless Internet connection. Today we visit the Cango Caves near Oudtshoorn, which are among the biggest stalagmite formations in the world. Some of the sandstone formations are colourfully illuminated and the bizarre shapes in the caves are mainly composed of calcium carbonate. They develop as limewater drips from the stones and evaporate. The structures growing down from the cave ceiling are called stalactites, while those that grow from the ground to the top are called stalagmites. After our tours here we depart via the stunning Outeniqua Pass to the town of Knysna where we overnight at Knysna Hollow (or similar). The Garden Chalets and Rooms are set in lush gardens and have been tastefully decorated with a Knysna forest feel. Room amenities include televisions, tea and coffee making facilities and private patios. This morning after breakfast we visit the "Featherbed Nature Reserve". This spectacular four-hour eco-experience includes a return ferry, walk and lunch and a 25-minute ferry trip on the Knysna Lagoon to the Western head (The Reserve is only accessible by ferry.) Upon arrival, guests board a Unimog drawn trailer and drive up to the top of the Reserve. While stopping at a scenic lookout point, our specialist guide will share with you some fascinating tales about Knysna and the surrounding area while you enjoy the panoramic views. An optional 2,2 km guided nature walk takes you through the forest, onto the cliffs, into the caves and along the scenic coast. Once back in the Food Forest, a unique outdoor restaurant situated under the Milkwood Trees, you will enjoy a spectacular 12 dish buffet lunch. Later this afternoon you are at leisure to stroll around the town or the cute Knysna Waterfront to catch up on some shopping or relaxation. This morning we travel to the Addo Elephant Park, stopping along the way to visit Plettenberg Bay and then on to the Bloukrantz Bridge where you have the opportunity to bungee jump at this, the highest commercial bungee jump in the world at 216-metres! Please note that this is for your own account. We may also then visit the Tsitsikamma National Park and walk to the suspension bridge over the Storms River, the round trip taking about an hour and a half and then a stop at the Paul Sauer Bridge over the Storms River to take a stroll onto the bridge and enjoy lunch here. After lunch we head for the Addo Elephant Park which lies deep within the shadows of the dense valley bushveld of the Sundays River region of the Eastern Cape. Here the evenings are punctuated by the strident howl of the black-backed jackal, and the francolins call heralds each new dawn. Safe from relentless persecution in the past, the grey leviathans of the bush now roam in peace. The original Elephant section of the park was proclaimed in 1931, when only eleven elephants remained in the area - today this finely tuned ecosystem is sanctuary to elephants, Cape buffalo, black rhino, a variety of antelope species, as well as the unique flightless dung beetle, found almost exclusively in Addo. Today we fly to Durban, where we will do a short orientation tour of this city. You may then have time here to enjoy the warm beaches of the Indian Ocean. We will overnight at the City Lodge, Umhlanga Ridge (or similar). Ideally situated next to the upmarket Gateway shopping and entertainment complex, City Lodge Umhlanga Ridge blends into the surroundings of its modern environment. The five-storey hotel is in the heart of the new business district that has emerged in the Umhlanga area and is a short drive from Umhlanga's popular promenade and beach front. We leave Durban after breakfast and travel through rural Zululand to St. Lucia where we board a boat for a two hour cruise on the lake in this proclaimed World Heritage Site. Here you are guaranteed to see hippos, and a very good chance of seeing crocodiles and a vast array of bird-life. After lunch we leave St. Lucia and proceed to the Hluhluwe Imfolozi Park where we would spend the night at Hilltop Camp. The accommodation here is in a brick under thatch chalet, each bedroom with its own private bathroom/wash-basin and toilet. Each chalet is also equipped with a fridge. Our game viewing commences immediately upon entering the gates into the park. This first evening we go on a sunset drive in an open game-viewing vehicle with staff from KZN Wildlife, the organisation that is tasked with running this reserve. This is to improve on your chances of seeing some of the nocturnal species such as leopard, lion, hyena, genet, bush babies and then the other nocturnal animals such as the owls and nightjars. Today will be spent on extended game drives to various areas of the Park, with an early start to make the most of the day and to possibly chance upon one of the predators returning to their day-time lair. Set in the heart of Zululand, this is the oldest game reserve in Africa, where Zulu kings such as Dingiswayo and Shaka hunted and put in place the first conservation laws, where today the "big five" of African legend stalk the verdant savannah. Established in 1895, game viewing is the prime attraction. As the home of Operation Rhino in the 1950s and 60s, the Park became world renowned for its white rhino conservation. The Park covers some 96 000 ha and contains an immense diversity of fauna and flora. Hluhluwe is characterised by hilly topography, and this northern section of the park is noted for its wide variety of both bird and animal life. Sightings of rhino, giraffe, buffalo, wildebeest, zebra, warthog, baboon, vervet monkey, and antelope such as impala, nyala and kudu are seen frequently and with the possibility of seeing lion, leopard, cheetah, elephant, black rhino, hippo, crocodile, monitor lizard, hyena and antelope such as red duiker, steenbuck, waterbuck, bushbuck and then the rare Samango monkey and wild dog, much less frequently. These drives are conducted with your guide in his/her vehicle. After our morning game viewing we leave the Hluhluwe/Umfolozi Park and travel to Swaziland making our way to Reilly's Rock (or similar). Situated in the Mliliwane Game Sanctuary, Reilly's Rock's unique lodge has been tastefully decorated in keeping with its colonial roots by Swaziland's leading conservation team. Notwithstanding the necessary subtle additions and renovations, the house still stands as it was built almost a century ago. Mliliwane Game Reserve is Swaziland's pioneer conservation area and is situated in a beautiful, secluded sanctuary in Swaziland's Valley of Heaven, the Ezulwini Valley, an area between Mbabane and Manzini. The Sanctuary covers 4,560 hectares and comprises of a southern and northern section. The southern section is predominately open grassland plains with middleveld vegetation, stretching up onto the striking Nyonyane Mountain with its exposed granite peak known as the "Rock of Execution". Nyonyane is where ancient San once lived and where Swazi Royal graves are situated giving historical significance. The Kingdom of Swaziland is a country located in Southern Africa and is relatively small in area, similar in size to Kuwait. Swaziland is a landlocked country, bordered by South Africa on three sides except to the east, where it borders Mozambique. The country, inhabited primarily by the Swazi people, is named after the 19th century King Mswati II, from whom the people also take their name. After breakfast we depart for the Kruger Park. 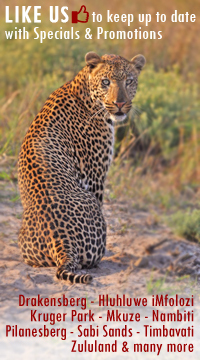 The world-renowned Kruger National Park offers a wildlife experience that ranks among the best in Africa. Established in 1898 to protect the wildlife of the South African Lowveld, this national park of nearly 2 million hectares is unrivalled in the diversity of its life forms and a world leader in advanced environmental management techniques and policies. After an early morning game activities we travel to the Drakenberg Escarpment. The scenery is pretty flat but changes as we approach the Drakensberg Escarpment where we climb up to the Highveld through scenic passes. This Drakensberg Escarpment area is really beautiful and has scenic vistas over the Lowveld of the Kruger National Park. We then make our way to Johannesburg where you will be dropped off at your hotel or at the O R Tambo International Airport in time for your flight.